You can sign up and log in through 3 methods. Signup and login with email requires email address, name, and password. It also requires a one-time only email verification initially. This is for features like password recovery. Users with Facebook or Google account can press Facebook or Google button to sign up and log in. Check ‘Stay logged in’ when logging in to stay logged in without having to log in every visit when visiting Moaform. This setting is not recommended for public PC. Use only on personal PC. You can log out by clicking ‘Log out’ at the bottom of the menu which appears when you click your name in the upper right corner when logged in. You can connect your social media account after signing up with email and you can also connect your email account after signing up through social media. You can press Facebook or Google button under Social media account settings at the bottom of account settings to connect corresponding accounts and use them for logging in and distributing surveys. Vice versa, you can sign up with Facebook or Google and configure the password under account settings to log in with email and password when logging in next time. Members signing up with email are requested to verify their email. Verification email is sent to the email address filled in when signing up and you can complete verification by clicking the verification button or link within the email. If you cannot find the verification email or have deleted it by mistake, click re-send button in the verification notification bar at the top of Moaform screen to receive the verification email again. Only the most recent verification email is valid. In other words, you must click the verification button or link in the email that you have received most recently if you have received multiple verification emails and remember that there is no use in clicking the button or link in the previous emails. If you have filled in the wrong email address when signing up, you can change the email address through the verification notification bar at the top of Moaform screen or under account settings. You can complete the verification by using the verification button or link within the verification email sent to the changed email address after changing the email address using the email and password you used when signing up. If you forgot the login password, you can use the password reset function at the login screen to configure a new password. Password reset sends a link for you to reconfigure the password to the email address which you filled in when signing up. Therefore, you cannot reset your password if you did not enter your email address accurately when signing up. If you wish to change your password when logged in, you can go under account settings to change the password by entering the old password and the new password. The password is encrypted and not even Moaform operator can access it. Fill in your email address accurately and keep your password safe. Moaform uses Amazon AWS cloud server and it communicates securely through SSL/TLS encrypted connection. SSL (Secure Socket Layer) and TLS (Transport Layer Security) utilize server authentication and data encryption to communicate securely to safely transmit user data. Moaform only accesses, edits the forms and its response data created and collected by users at request of authors for technical support only and nothing else. User password is encrypted and not even Moaform operator can access it. You can click ‘Create New Form’ button in Global Navigation Bar which you can find at the top of the screen or click ‘Create New Form’ which appears within the menu that displays after clicking your name on the upper right to create a form. You can enter form title (Required) and configure form language (Optional) to generate a new form. Form language configures which language the form will be conducted in along with buttons below, error messages, etc. Form control bar: This has menus of survey progression, save status, apply changes (Displayed when editing form while collecting responses). Page control bar: This allows to create a new page, copy page, delete current page, navigate pages, configure page options, and preview the form. Left panel: This generates various types of questions, configures form design along with other configurations necessary for logic settings and creating forms. Block control: You can move, copy, or delete blocks. Preview area: You can see how the form being created is displayed and it displays tips and visual aids for creating forms. You can create a ‘Welcome’ page when creating a form. ‘Welcome’ page is not displayed to respondents if there is no content. Writing content for ‘Welcome’ displays ‘Welcome’ page to respondents prior to responding the form and respondents can begin responding the form by clicking ‘Start’ button below. You can utilize it freely for introduction to survey, survey method, etc. ‘Thank you’ page is configured to be used always. It displays the phrase, ‘Your response has been submitted. Thank you.’ by default and the author can freely edit this phrase. You can add, copy, delete, or move pages when creating a form. When you need two or more pages, you can press add new page button on the page control bar to add a new page. When you press add new page with multiple pages in the form, it adds a new page right after the current page. Copy page copies the page selected currently. To delete a page, move to the page you wish to delete and then press delete current page button. You can click and drag the page on page control bar to move the page to desired location. You can add, copy, delete, or move blocks when creating a form. You can press ‘+’ button in the location you desire within the preview area on the right side to insert a block you want. Or you can click the desired block format under the ‘Create’ tab within the left panel or drag it to the preview area on the right side to add a block. You can just click it to position it at the bottom of the current page. If you select the block in the preview area, a button to move, copy, or delete the block appears on the upper right of the selected block. Also, the editing window which can edit the selected block appears on the left side of the screen and the bottom of the editing window also displays the button to move, copy, or delete the block. ‘Move’ button within the editing window and on the upper right side of the block is a function that can move the selected block to a designated page. If you want to change the order of blocks within the same page, drag the arrow appearing, which you can find at upper left side of the block when you click it or the mouse is placed over it, to the place you want. Copy block copies the same block right below. Delete block deletes the block. These are types of questions supported by Moaform currently and their descriptions. Information: This is used for the purpose of delivering information that does not require response from the respondent. You can insert text, image, or video. Single Choice: You can only select one answer among multiple choices and create ‘Other’ choice. You can assign scores to each choice. Multiple Choice: You can select multiple answers among multiple choices. You can configure minimum and maximum number of responses. You can assign scores to each choice. Dropdown: Basically, it is same as Singe Choice but its shape is in a drop-down box. This is useful when there are many short choices. You cannot insert image or video in Dropdown format. Ranking: You can rank when you select answers. Answers selected first have higher rank and you can configure minimum and maximum number of responses just like selecting multiple choices. Media Single Choice: This is a Single Choice question based on image. You can only select one answer among several image choices and you can configure card size and photo placement. Media Multiple Choice: You can select multiple answers among several image choices and you can configure card size and photo placement. Media ranking: You can rank among multiple image choices and you can configure card size and photo placement. Star Rating: It is similar to Point Scale but its rating is indicated by stars, smileys, or hearts. You can configure it from levels 3-10 and it can be configured to display scores. Net Promoter Score (NPS): It is a standardized question that measures customer loyalty by asking how much your product or service is recommended to a friend or colleague. It is a standardized question and some settings cannot be changed to maintain the same question as much as possible. It is recommended that sentences are edited to ‘Our services, our company, etc.’ only in the part stating ‘Our products’. Even small changes in the phrases may alter response tendency of respondents and this may derive from the standard. Matrix Single Choice: You can create sub-questions to share the same choices in matrix form. You can only select a single answer per sub-question. Matrix Multiple Choice: You can create sub-questions to share the same choices in matrix form. You can select multiple answers per sub-question. Matrix Ranking: You can create sub-questions to share the same choices in matrix form. You can rank. Long Text Answer: This is a question where the respondent can enter a response directly. It allows line breaks via enter key and it is useful for receiving long responses. It displays visually larger entry field. Short Text Answer: This is a question where the respondent can enter a response directly. It does not allow line breaks via enter key and it is useful for receiving short responses. It displays a single-line entry field. Numeric Value: It receives numeric value that can be calculated. It is limited from -9,999,999,999.99999 to 9,999,999,999.99999 (10 Digits above decimal, 5 digits below decimal). It is better to use free format or regular expression format for simple number input such as phone numbers and serial numbers. Numeric value type questions can configure input range and decimal limit. Email Address: You can only enter email address. Website Address: You can only enter website address. Line Shape: You can position the decorative line shape. You can configure shape and transparency of the line. You can change the outlook of your form through various combinations of overall background, page background, font color under the style tab within left panel. Background settings: You can upload an image file to insert your own unique background. A background image can be positioned to fit to screen, upper left, upper center, or upper right as well as in repetitive pattern. You can also select a color you desire on the color palette instead of using an image for the background. Page style: You can configure the color of page as you wish and adjust transparency to create a harmony with the overall background. You can increase transparency to 100% to remove page shape and only use the overall background. Font and style: You can change font color for questions and choices as you wish. Color for all questions change altogether, same for choices too. Icons of scale type questions are depending on choice color. You can save the style combination you like to the style collection and use it again in the future. You can configure logic under logic tab within left panel. Logic is a function that can be configured by the user for certain action to be taken when certain conditions are met in responses through conditional, consequence, and timing. Normal operation is not guaranteed for reversal logic or circulation logic such as moving to previous page or hiding previous questions when configuring the logic so please do not use the logic in such manner. IF certain page is submitted: It is satisfied if a certain page is completed and submitted by pressing ‘Next’. IF certain question is certain answer: It is satisfied if the answer to a certain question is a certain choice. It can be configured for all choice type questions. IF certain question is not certain answer: It is satisfied if the answer to a certain question is not a certain choice. It can be configured for all choice type questions. IF certain question is answered: It is satisfied if a certain question is answered. IF certain question is not answered: It is satisfied if a certain question is not answered. It can be configured when the question does not require to answer. Jump to certain page: These signals jump to a certain page. End survey: These signals to end survey and it moves to ‘Thank you’ page no matter where it is currently positioned. Exit to the web page: This ends the survey and moves to the designated web page. Show/Hide certain question or page: This shows or hides certain question or page. Timing configuration: This determines when IF, THEN logics are executed. (WHEN) It is automatically recommended when configuring IF conditionals but you can configure the timing you desire after changing it to manual configuration. Answered certain question: This assesses the logic if a certain question is being answered or has been answered. Submitted certain page: This assess the logic if ‘Next’ button is pressed to submit on a certain page. The basic operating principles are as the following. If no conditions are satisfied, it moves to next page by default. All conditions are independent of each other and only the logic satisfying WHEN timing is assessed. It is assessed in order from bottom to top logic. Some additional references are as the following. You can turn on ‘Hide item’ option for each block to hide the block by default. If you wish to use the show function, use the show function after hiding the question by default. There is also ‘Hide page’ option within the page option menu on the right side of page control bar. When both WHEN and IF conditions were satisfied simultaneously causing a crash in the consequence, the lower logic is executed first and the upper logic is executed later so as a result, the consequence from the upper logic overwrites the consequences of lower logic among consequences in a crash. When several consequences exist within a logic, only the consequences in a crash are overwritten and consequences not in a crash are executed as configured. Logic may not operate normally when you show/hide previous question or page or when jumping to a previous page. This is not officially supported so such use is not recommended. Complex operations where one logic affects the other logics in sequence are difficult to predict even for the author so please refrain from using such operations and construct a simple logic. Logic is a function currently under beta testing. Some parts of it may become paid service when it is being serviced normally. Logics within forms in progress when they become paid services will continue to operate. Moaform saves the data automatically and there is no need to press save when creating the form. You can restore or revert the survey by ‘Undo’ or ‘Redo’ buttons on upper left. Save status is displayed on the upper left when the form is edited. There is the progress menu which displays creation progress at the upper center of form builder and you can press ‘Collect’ once you compete editing the form to start collecting responses after various configurations. If the content of form is edited after response collection begins, the edited content is saved automatically but this content is not reflected on the response page right away and it is reflected on the current response page after pressing apply changes button on the upper right. This is because the survey may appear strange to the respondents if such edited content is being reflected real-time on the response page. Please press apply changes button on the upper right after editing the content of form while responses are being collected. If you wish to revert to an earlier version when the response is being collected while making changes to the content of form collecting responses, press restore button on the upper right. Response collection begins once several settings are configured for Collect upon completion of form editing. You can begin response collection by pressing ‘Start response collection’ after completing the configuration of Collect. You can configure starting and ending point of collecting responses. If you do not make any configurations, the response collection will begin at the point when you press ‘Start collecting responses’ and responses will be collected without time limit until the author ends the survey. When the starting point has been configured at a previous time than the present, response collection will begin as you press ‘Start response collection’ button and if the starting point is at a later time than the present, response collection will begin automatically once such period of time arrives. You can configure starting and ending point of collecting responses up to unit of ‘Minutes’. Once response collection starts, you cannot edit the starting point but you can edit the ending point. You can end the survey by limiting the number of responses. The survey ends by whichever condition that is met first among ending point and limit to number of responses configured above. You cannot edit as below current number of respondents. This configures how many times a respondent can respond to the survey. Allow: You can response multiple times. Limit to cookies: You can limit to cookies to allow responding only once within the same browser on the same device. Limit to cookies and IP: You can limit to cookies to allow responding only once within the same browser on the same device or same IP. Only one person may be allowed to respond in an environment where IP is shared such as cafes and offices. Limit to response code and URL: You can issue response code and URL that can only be used once and distribute to respondents. Details regarding response code and URL will be explained in detail below. You can configure multiple response limit to ‘Limit to response code and URL’ and start collecting responses to issue and manage response code and URL. You can issue up to 999 response codes and URLs at once and maintain up to 30,000 totals. You can delete response codes and URLs and you cannot respond through deleted response codes and URLs but the response data will not be deleted if responses were already collected through them. response code and URL are paired together and the response code is paired with the latter portion of URL. Paired response code and URL are considered as the same response so you can only utilize one of the paired response code or URL. Respondent must access through basic URL given at the beginning of response collection and enter the response code to begin responding. You cannot respond twice with the same response code. You can respond by pasting the URL in the address bar right away. You cannot respond twice with the same URL. response code and URL must be distributed by the author to respondents directly. You can check response completion status under ‘Response status’ within the results page when you use response code and URL. Also, you can identify which response code each respondent has used to respond if you download the results in Excel file. This configures the results to be shown to other people besides the author. Show always: This allows external parties to check results even when the survey is in progress. Show when closed: This allows external parties to check results after the survey ends. Private: Only the author can check the results. You can designate the range of results showing when show results settings is at ‘Show always’ or ‘Show when closed’. You can decide whether ‘Result’ button is displayed in the Thank you page as an option. When ‘Result’ button is exposed in the Thank you page, respondents will see ‘Result’ button after completing the survey and move to view results page once they press this button. Results are revealed as configured in the scope above in the view results page. If you decide not to display ‘Result’ button, then only the people who know results page URL can move to results page. If you wish to share the results with only specific people, do not display ‘Result’ button and let them know of results page URL for that person only. You can expose form URL and sharing buttons to respondents to share the survey even more easily. Allow: Respondents can use the share button and URL provided by Moaform. Restrict: A share or URL button is not exposed by Moaform. You cannot restrict the manual sharing through URL that is already shared externally even if you restrict this. It is recommended to use the password configuration if you wish to strongly limit the respondents. It can be edited even when responses are being collected or when the survey has ended. You can use a function where the respondent must enter a certain password to start responding. The password is configured by the author and must be notified to respondents individually. The password can go up to 10 characters in combination of alphabets and numbers and it does not distinguish capital and small case letters. You can write a guiding phrase for the password. You can edit it when responses are being collected. You can begin response collection by pressing ‘Start collecting responses’ after completing the configuration of response collection settings. Once responses begin to collect, only a part of the form content and options can be edited so start collecting responses after sufficiently reviewing the form through preview. Once response collection begins, various methods will be notified. Moaform provides URL, QR code, SNS sharing, and messenger sharing functions. You can collect responses using form URL. You can use this in a wide variety through email, SMS, posting on notice board, etc. Survey URL identifies capital letters so please beware. Pro service users can use surveyl.ink address as response address instead of moaform.com address not to expose Moaform brand. When using surveyl.ink address, you can configure the address under surveyl.ink/. Address under surveyl.ink/ features 3 to 100 characters consisting of capital and small case alphabets, numbers, -, and _. Changing the address to surveyl.ink does not allow responses to be given in moaform.com address and the same applies vice versa. You can also respond using QR code. QR code image provided by response collection page is the QR code for actual responses and you can click it to download it as SVG or PNG file for use. You can share through Facebook, Twitter, KakaoStory, and Band immediately and you can also share through KakaoTalk on mobile. You cannot share through KakaoTalk on PC. This is because KakaoTalk PC does not provide immediate sharing function. Inserting the code provided by Moaform in html page allows you to embed the form in a popup format in the web page. You can embed in the format of left side popup, right side popup, or center popup. You can enter URL in the address bar within the web browser, click shared link, or scan the QR code with an app to respond right away. Moaform response is supported in most devices and browsers including IE 9, 10, 11, Edge, Chrome, Safari, Firefox, etc. Moaform does not support IE 7, 8. Attempting to respond through IE 7 or 8 would automatically display a message guiding you to respond through a different browser or mobile. Collected responses can be viewed as graph and chart in results page. Results page features results by question which consolidates the results from all respondents and results by respondent which displays responses by individual respondent. Also, there is the SmartFilter function which allows you to view results for different questions through filtering certain responses to certain questions. Furthermore, you can download the response summary for all responses or individual responses to all questions as CSV or Excel file. Results can be viewed via PC and mobile but the SmartFilter is can only be used in PC currently. You can view results for all respondents by each question through chart and graph. You can view through bar, column, and pie graph for graphs and organize the results by ascending and descending orders for number of responses and use expanded view to view the responses in chart form. You can download graph as an image through chart image download function. You can view responses by individual respondent. This displays time of response and time elapsed for each respondent within the list of respondents and selecting each respondent shows responses for the selected respondent. Respondent list can also be organized by response time and time elapsed for response. SmartFilter is a function that filters responses through various conditions. All filters are configured as ‘Included’. This is a setting to include selected choices and it is not a filter to exclude choices that were not selected. The filter between choices for multiple choice questions is the ‘OR’ condition. The filter between questions is the ‘AND’ condition. Currently, you can filter choice questions (Single Choice, Multiple Choice, Ranking), scale (Point Scale, Star Rating), and response date (Up to unit of day). You can download data by pressing [Download] button on the upper left of the results page. Data download is performed by generating a file that you wish to download through configuration. File generation can take several minutes depending on content of survey and number of responses so please wait until file generation is complete. File generation can be performed up to 4 files simultaneously and generated files are stored for 14 days. It is automatically deleted after 14 days and you must generate the same file again if you need the same file afterwards. Types of data you can download are as the following. If you have filtered the results using the SmartFilter, you can select whether to download entire results or results applied with filter. You can select how multiple selections for Multiple Choice questions are displayed when you download all data for all questions and responses. Expanded type displays all choices of multiple selections within Multiple Choice questions by separate columns. Summary type displays all selected choices in a single cell. All data can be downloaded in Excel or CSV files. This is the first page when you log in and this is the page where you manage all forms you created. Forms can be viewed by form status and it can be organized by title, number of respondents, last response date, and last revision date. You can designate groups to forms to systematically manage and search forms no matter how many forms there are. You can see results, share, edit, preview, delete, copy forms, force to end, or stop pending. You can manage each form through ‘My forms’. Delete form: This deletes the selected form. You cannot recover after deleting. Force to end: This only activates when survey is in [Collecting] status and it stops response collection and puts the survey in [Closed] status. Also, you can click the form title to get into form builder. You can designate and manage a group for each form. Moaform utilizes the tag type management method rather than the folder method which is the traditional file management method. Folder format features files in layer structure only belonging to a single folder so it is difficult to manage and categorize files with various standards. However, tag method can feature a single file belonging to several categories and each category can also be assigned to various files which makes a more complete management possible. You can designate, add, or delete the group under My forms afterwards. As for group, you can access groups you created and add, delete, or edit groups under a separate group management menu. Group management is at the bottom of search window on top of My forms. You can click the magnifying glass shape at the top of My forms to activate a search window that can search surveys. You can search by group if there is a group designated form or by form title. Moaform members can manage their member information under settings page. Account settings contains log in account settings related to log in as well as payment information related to membership and payment. You can change email and password in log in account setting. To change email, enter the email address you wish to change to and click ‘Change’ button. You must enter the current log in password to change email and the email requesting authentication is sent to the new email address just like when you first signed up. You must authenticate the email address as it is used for password recovery. You can change the password by enter the current password and new password. You can link your account with your social media account for more convenient log in and form sharing. It is automatically linked when you log in with your social media account when first using the service. If you wish to link additional accounts, you can click ‘Link’ button for Facebook and Google under log in account settings. You may have to enter the password for selected social media service when making a new link. You can check information regarding the service level you are using and payment. Service: You can check the service level you are currently using. Auto renewal: You can turn on/off automatic renewal function. Payment method: You can check the registered credit cards. Moaform only saves the last 4 digits and expiration date of the credit card to identify registered credit cards. Moaform does not save any other credit card information. Contact for payment: This is information necessary for us to contact you regarding your payment. Payment summary: Your payment history is listed here and you can access your invoice through here. Form creation and management functions of Moaform operate well within most recent browsers such as Chrome, Edge, IE 11, etc. But they do not support IE 7, IE 8, IE 9, or IE 10 so please download and use the most recent browser. However, responses can be made from IE 9 and above. Not even the responses are supported for IE 7 and 8. Attempting to respond through IE 7 or 8 would automatically display a message guiding you to respond through a different browser or mobile. You may see the message that you cannot respond through IE 7 or 8 even when you are using IE 9 or above or the message that you cannot use form builder and management functions of Moaform even though you are using IE11. 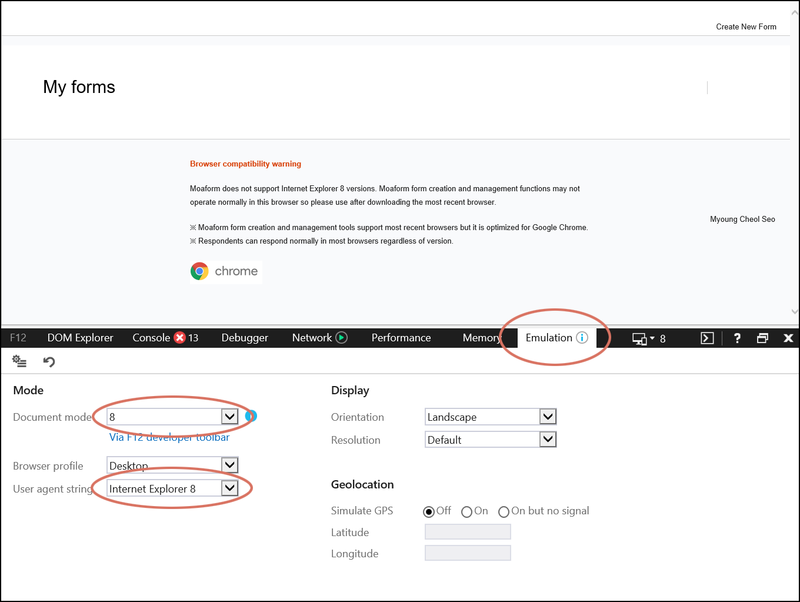 In this case, please follow the procedure below as the IE browser compatibility setting may have changed. Open the Internet Explorer and press ‘F12’ on the upper section of the keyboard. A separate screen will open up at the bottom of the screen when you press the key. Open the ‘Emulation’ tab at the top of the window and then check what the values are at two indicated locations. If any of the two values have been configured below the current IE version, change both values to the most upper version. After completing the procedure above, enter the form address in the address window again and the try to respond again. If the issue cannot be resolved by the methods mentioned above, please contact Moaform customer support. Currently, you cannot not create or edit forms using the create survey tool of Moaform via mobile. Please use PC for creating and editing forms. Responses can be taken via PC or mobile for IE 9 and above. Not even the responses are supported for IE 7 and 8. Attempting to respond through IE 7 or 8 would automatically display a message guiding you to respond through a different browser or mobile. Currently, Moaform offers three types of service: Basic, Pro, Custom. Basic is a free service and anyone can use all functions included in the Basic service for free without restriction. Pro service is a paid service that can use all functions included in the Basic service as well as removing Moaform brand and exposing user’s own brand along with other additional functions. You can select monthly or annual payment and annual payment is equivalent to benefiting from free 2 months of service. Custom service is a service for members making large quantity of purchases and it can be adjusted in terms of price and functions through negotiations. You can use free 7-days Pro service trial to try our Pro service for 7 days. You can pay for the Pro service after 7 days or downgrade to the Basic service which would result in deactivation of Pro functions in all forms using Pro functions. Check [Pricing] for function details and prices according to services. Payment when using paid Moaform services is made through PayPal and credit cards (Korean credit cards only). If you use PayPal, it will be charged in US dollar. Moaform uses SSL/TLS server authentication and data encryption to communicate safely for credit card transactions to transmit user data safely. Moaform does not access or save the entirety of user's credit card information. Only the last 4 digits of card number and expiration date are saved which are minimum information for identification of payment information. Automatic renewal function is provided to eliminate the inconvenience of paying again after usage period for paid service expires. Automatic renewal refers to paying for the same service with the credit card or PayPal used for previous payment once the monthly or annual service period expires. Moaform is notifying the users of automatic renewal payment at the bottom of payment page. Automatic renewal can be stopped any time. If you want to use automatic renewal function again, you can simply turn it back on or you have to pay manually after the service expires. You can easily stop using automatic renewal function under Settings>Payment Information page. In Settings > Payment Information page, you also can access the transaction statements for payments made until now. You can access transaction details under Settings>Payment Information page and you can click transaction statement number to access invoice for selected payment. Invoice outlines details for amount of payment along with information of credit card used for payment. You can print the invoice by clicking print button on the upper right. You can click transaction statement number under Settings>Payment Information page to access invoice and credit card receipt. Credit card receipt can only be accessed when you pay with a credit card and one of the following three information must be entered. If you enter one of the following information above you can access and print the credit card receipts. Empty window being displayed when you try to access your credit card receipts is due to popup blocking. Try again after disabling popup blocking in the browser settings.